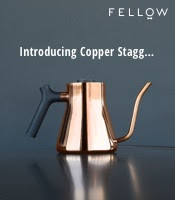 While I am all about using coffeehouses as a rendezvous for friends, waiting at a crowded one with little promise for a table can be a bit trying. Twas my luck when meeting up with friends at Kean Coffee in Newport Beach. The traffic proved nil for my wife and I as per our course, but our friends had worse fortunes and they ended up sitting on the 405 for some time. So to kill some time while the wife and I waited, we decided to get our coffee and wait inside. Kean Coffee sits in a small shopping center with a few outside tables along its long windows. Inside, Kean has a moderately-sized cafe with nice wood furniture and tribal chandeliers. The apparent popularity of the place showed with the impossibility of getting an inside table but fortunately, there were a few seats outside. Kean roasts their own coffee on a drum roaster in the back corner of their store (they were putting a couple batches through while we were there). I sampled their Ethiopian Sidamo, and to my delight it produced a very floral and bright cup, with noticeable berries throughout. The espresso came out decent, with strong tones of citrus and caramel but a fair amount of char on the back end. I didn't note the tea at the time, but according to the website they have their own line of free leaf teas. By the time my wife and I finished our drinks (she had a delicious mocha), our friends arrived and we made our way to lunch (which ended up a bit more of a drive up to Culver City). In the end, I liked my experience with Kean and thus, if you're in the area looking for decent coffee, give it a try. I had a similar experience in Nashville, The place was called crema and they had an amazing cup of joe! I love straight up coffee with nothing in it you can really taste the beans. 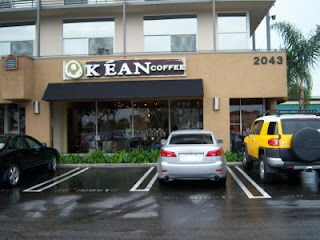 Kean Coffee was one of my favorites when I lived in the OC. Martin Diedrich used to run a chain of shops that used his family's own plantation grown beans. He sold out to Starbucks but reopened as Kean's. 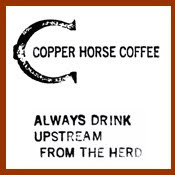 So glad he did, the coffee is great as you know. Sidenote: it's named for his son.